Honda has been quiet for a while but the Japanese giant is far from sleeping. 2013 promises to be a milestone year for the brand in India and the story begins with this, the Honda Amaze. The Amaze is popularly being called the Brio sedan and that is what it is. Honda have extended the wheelbase of the Brio platform, reworked the three-box body past the B-pillar to integrate the boot as cohesively as possible, adding minor design updates to the front fender and a flat rear fender that brings the car smoothly under the four-metre mark. The underpinnings are more or less the same as the Brio - McPherson struts up front and the torsion beam set up at the back. The wheels are also the same size as the Brio but with a new alloy design. More Brio cues lie on the interior and that's a good thing. The Amaze features the same uncluttered, functional, good quality dash layout and Honda have used the extended wheelbase to create a spacious cabin, keeping the rear passengers comfortable. Honda's first diesel engine specially developed for India is the new 1.5-litre i-DTEC motor (the 1.2-litre petrol from the Brio, will be the other engine on offer of course). The engine is based on Honda's 1.6-litre i-DTEC unit and has been downsized for India which means it will fall under the lower excise bracket. The engine claims to offer class leading acceleration and efficiency. The key benefits of the Earth Dreams technology engine is that it is compact and light, there is reduced mechanical friction (as less as a similar displacement petrol motor) and lower energy loss with the cooling system. The all-aluminium open deck engine is claimed to be the lightest engine in its class. The piston skirts are narrower and shorter with a smaller surface and helps reduce weight and helps lower frictional loss, the crankshaft and connecting rods are also lightened for better acceleration and fuel efficiency. The fuel system features an electronically controlled fuel injection system with a high pressure fuel injector. Honda has even developed a special low viscosity diesel engine oil for the engine. All of these technologies help the engine produce the highest power and torque figures. 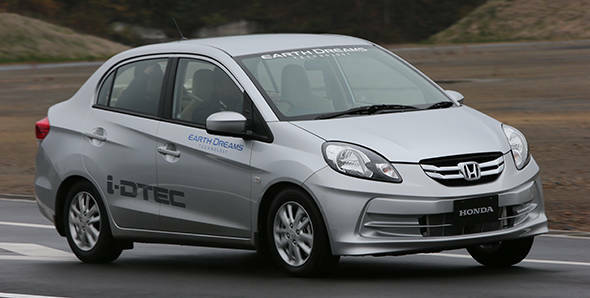 The engine is also claimed to be very fuel efficient, infact it will be India's most fuel efficient car. No official figures have been announced yet but this feels like a 100PS/200Nm diesel. In driving, it is quiet but not utterly silent at idle, but refinement improves once you are on the move. Power is effortless and this will be a good car to drive. The handling too is clean and sharp but you cannot call it sporty because Honda has chosen to spring this car for a plush ride quality which means a little body roll. But on the tarmac we were given the car on, the ride felt promising. The Amaze has all the makings of a great city sedan. Both the petrol and diesel models will be offered in three variants each. We expect Honda to price the car competitively. Honda will officially enter the entry-sedan market with the Amaze early next year and for a fully detailed first drive, check out the new issue of OVERDRIVE, on stands November 23, 2012.